A noticeable growing trend in cosmetics in Malaysia, is in the demand for halal-compliant products. According to Credence Research, the halal cosmetics market is projected to grow with a compound annual growth rate (CAGR) of 12.9% from 2017 to 2025. With good socio-economic conditions and a significant Muslim population estimated by the Pew Research Center at around 1 billion – three times more than that of the Middle East – the Asia Pacific region dominated in 2016 and was accounted for approximately 62.2% of the overall market revenue. The halal label, distinguished by its high quality, safety and ethical compliance seems to appeal to Muslim and non-Muslim consumers alike. Religious ideals aside, the demand for halal products has been fueled by concerns about the presence of animal-derived ingredients and alcohol in some non-halal cosmetic products, thus expanding its audience as to include the vegetarian public along with those looking for products that are safer for the skin. The values promoted by halal certified products have become synonymous with ethical consumerism, and range from social responsibility and animal welfare, all the way but not exclusively to, religious compliance. 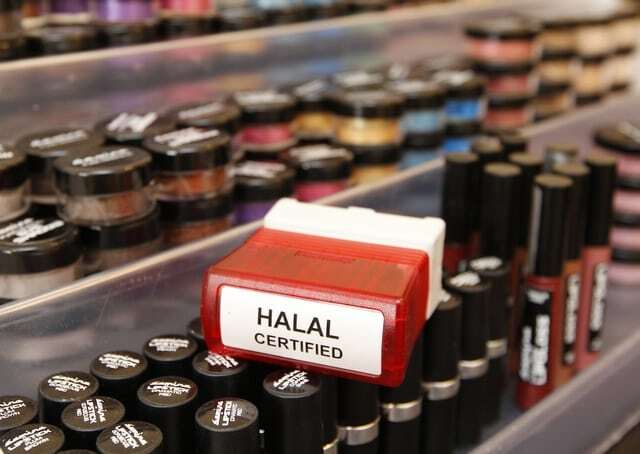 The tedious certification process and stringent requirements has driven a wide number of diverse consumers to perceive halal cosmetic products as generally safer. Halal certification, though not compulsory yet in the realm of cosmetics, is a significant marketing tool. Case in point, the local brand Sugarbelle Cosmetics that markets its halal certified products as safe, effective, and of premium quality. Sugarbelle Cosmetics’ halal compliance is deemed, by the brand itself, a fundamental strength leading to its success. With the inception of its very first product, a creamy liquid lipstick, Sugarbelle Cosmetics has made halal certification its utmost priority thus carefully selecting its manufacturers based on their very ability to be halal compliant. Sugarbelle Cosmetics’ success in the decidedly competitive cosmetics field is a good indicator of the opportunities offered by halal certified products. Another success story in the halal universe is that of the Malaysian perfumer Josh Lee. Trained at the renowned French perfumery institute, ISIPCA, Josh Lee specializes in halal certified fragrances. The perfumer’s website clearly emphasizes the value of halal certification, one that encompasses the strict quality of the ingredients, as well as the environment required for proper production. Josh Lee emphasizes the absence of harmful and unhygienic ingredients to its Muslim consumers, while pointing out to non-Muslims that the Josh Lee fragrances are produced in a safe and sanitary setting, featuring an extreme level of quality control. Another point put forward by Josh Lee pertains to the absence of animal testing. prime choice of raw materials used, a compulsory cleanliness of the factory, workers, handlers, and immediate surroundings, to a strict control of transportation; each and every one of these factors are indispensable to acquire the certification. JAKIM’s halal certification is valid for 2 years beyond which a review audit is mandatory to retain the certification. Imported food and goods marketed in Malaysia can be labeled halal if they comply with the above listed requirements. Alternatively, imported products can be certified halal by an accredited foreign body – sanctioned by JAKIM. Currently, JAKIM recognizes halal certifications originating from 69 certification bodies from 42 countries, out of which 9 are members of the European Union. In a world where ethical responsibility and social accountability are key, the halal market is an evident opportunity that European beauty companies should not overlook. Another non- negligible element to keep in mind pertains to the interest in the halal industry of the Malaysian Investment Development Authority MIDA – a governmental agency aiding companies eager to invest in the manufacturing and services sectors, and facilitating the implementation of their projects.